Some very exciting news - I've been invited to guest DJ upstairs at the legendary Ronnie Scott's Jazz Club in Soho. Needless to say, this is something of a dream come true for me! 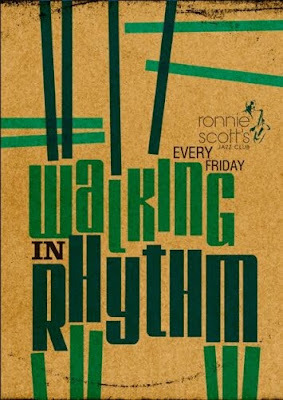 It's a weekly night called Walking In Rhythm which has a music policy very similar to Right On! - i.e. the best of vintage black music. This gives me a rare opportunity to play a mixed set like those I play at Right On! I'll be bringing along a bit of everything: jazz, soul, rhythm & blues, doo wop, funk, ska, calypso, reggae, boogaloo, mambo, samba and more - all on original vinyl. The session is held in the smart upstairs bar at Ronnie Scott's which was given a complete facelift when the club was refurbished a year or so back. For those who don't know, Ronnie Scott's is probably the UK's most important and famous modern jazz venue. It opened in Gerrard Street in 1959 and moved to its current premises opposite Bar Italia in Frith Street in 1965. Like Ronnie Scott's, Bar Italia is also still going strong and is the perfect place for a late night cappuccino after Ronnie Scott's kicks out at 3am. This is going to be a night to remember, and until I find a perfect new venue for Right On!, this should be a fix for anyone who has been missing it as much as I have. It's only a fiver to get in too - or free if you get there early enough - so being skint shouldn't be a problem either. And who knows, if I draw a big enough crowd maybe they'll invite me back!